This is an interesting and action-filled book for young children. It teaches several important concepts: counting from one to seven (and challenges older readers to count to fifty), days of the week, names of the young ones of animals, growth and development of the young animals through their playful activities, etc. 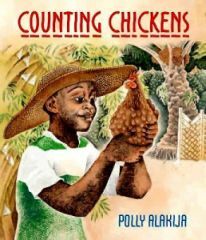 Some of the more complex concepts are the supportive and loving adults in the village who provide their children with opportunities to take on responsibilities; and the passage of time: it takes 21 days for the eggs to hatch and within one year Tobi has 50 chickens! The options Tobi has is to either eat the eggs, or wait for them to hatch. His patience pays off, because he has so many chickens that he starts his own business of selling eggs. The illustrations are lively and full of humor. They accurately represent the text, as well as extend the text by providing background scenes from the lives of the seven friends, the dynamic activity occurring in their homes and village, and the friendship/relationships among them and their families. This positive book about village life could have been strengthened even further had the author identified the Nigerian setting.